Our water is purer than both tap and bottled water. Our water is filtered seven different times by extracting the chlorine, negative minerals and solids within the water using the highest quality filtration system available - removing all unwanted chemicals and contaminants. Laboratory tests of our water typically score in the super low 12ppm range (parts per million), and that's after we have added minerals back into the water for flavor. In fact, our water exceeds the purity of our rivals at a rate of 99%, even the bottled water that you see on the shelves of your local grocery store or gas station. 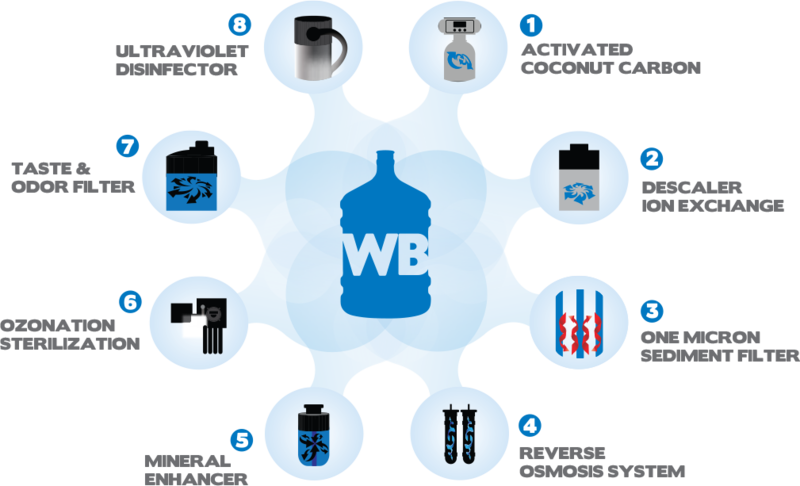 Consumers have direct access to instantly filtered and, thus, much fresher water at the source. The Water Bottle produces a premium quality product, superior than the product you typically pay multiples for - without massive environmental damage. You can't get much 'purer' than that. The Water Bottle maintenance is simple and done religiously. 1. Every day a technician checks The Water Bottle® to ensure all filters and mechanisms are performing at the highest levels. 2. After The Water Bottle® is tuned and checked to function properly, the technicians wipe down the exterior of the bottle including the vending windows and surrounding parts of the bottle. 3. Once completed, The Water Bottle® technician walks around the surrounding area of The Water Bottle® and picks up trash in the parking lot and landscape to help keep the city and center as clean as we can - we don't believe in or stand for litter. 4. The Water Bottle® technicians also carry a can of paint so if there are any flaws on the outside they can restore it to the original perfect condition. The Water Bottle is built to last, it is formed out of a precast concrete and is built to look good and be durable for many years to come.